Дата публикации: 27 августа 2017 .
finds that 57 percent of consumers’ time spent using digital media is now taking place in mobile apps. Of that, 50 percent is occurring in smartphone apps versus only 7 percent for apps on tablets. 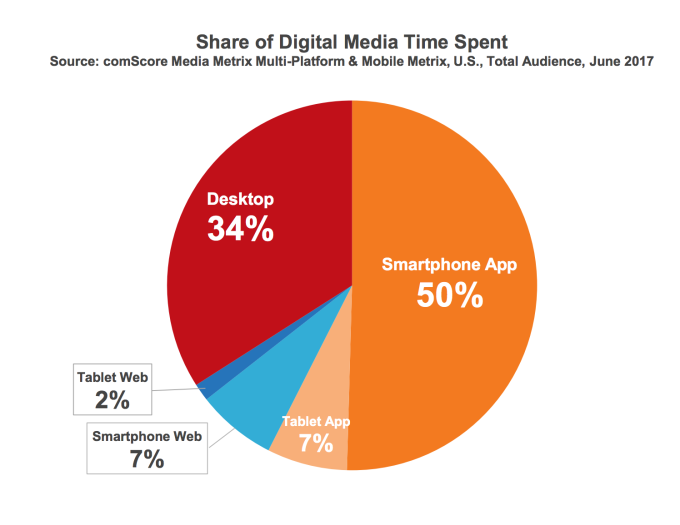 Desktop is trailing further behind, accounting for 34 percent of time spent, while mobile web is another 9 percent. The use of mobile apps to engage with digital media is even higher among younger users. comScore found that among those aged 18 to 24 years old, two-thirds of their digital media time is spent using smartphone apps alone. Not surprisingly, that percentage drops steadily the older the user, with just 27 percent of seniors 65 and older spending their digital media time in smartphone apps, for instance. Beyond digital media time, the younger millennials – those 18 to 24, that is – are just heavily using apps in general. They spend more than 3 hours per day in apps, compared with 2.6 hours for 25 to 34-year olds and 2.3 hours for 35 to 44-year olds, for example. In contrast to these findings about apps’ continued popularity and frequent usage, users aren’t rushing out to try new ones, it seems. Of those who download one or more apps on average in a month (49%), 13 percent download just one app, 11 percent download 2 apps, 8 percent download 3 apps, 5 percent download 4 apps, 7 percent download 5 to 7 apps, and 5 percent download 8 or more. Again, it’s millennials (18-34) who are driving much of the interest in new app downloads, the report also finds. 70 percent say they’re always looking for new apps to try, and they’re willing to pay. 1 in 5 downloads an average of one paid app per month, and nearly half make five or more in-app purchases per year. Other age groups show little interest in new apps, with only 37 percent of those 35 to 54 having interest in new and interesting apps, for example. The majority (66%) buys zero paid apps per month, and 58% makes zero in-app purchases per year. What’s worse, they’re also often deleting the apps they already have on their devices. While 57 percent of millennials say they download new apps more often than they delete old ones, only 30 percent of those aged 35 to 54 can say the same. People say they remove apps because they’re just not using them, their interest has waned, their phone needed decluttering, or because they need more storage space. 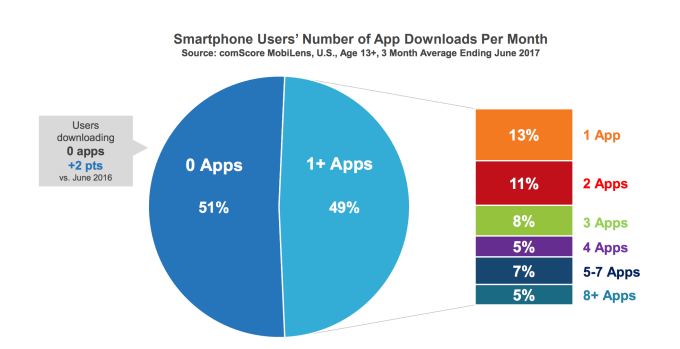 This isn’t the first report to find that most users aren’t downloading new apps. comScore spotted this trend back in 2014; it came up again last year in a report released in September. That this hasn’t changed over time is telling. It points to a sort of saturation point for apps, in terms of everyday use. 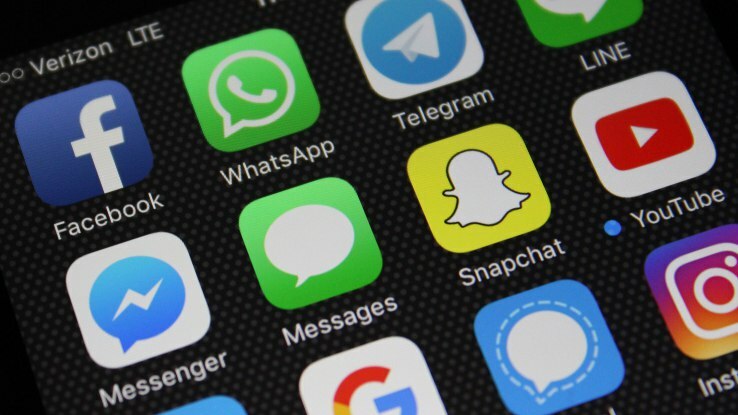 Facebook and Google, which have 8 apps out of the top 10, are enough for most people. Today, the majority of app users access 20 or fewer apps per month, and their number one most-used app accounts for half of all their time spent using apps. Their top 10 most-used apps account for nearly all the time they spend in apps. That leaves little room for newcomers. Even breakout hits like Snapchat aren’t finding traction on older users’ phones, it appears. The apps is #3 among 18- to 24-year-olds and #6 among 25- to 34-year-olds, but doesn’t make the top 8 for any user over the age of 34. The data almost makes it seem like there’s not much point in trying to build new apps for anyone but millennials, as they’re the only group showing serious interest in downloading more, a willingness to pay, and the ability to adopt a new app at scale. The report also looks more deeply into other habits of this younger demographic, even noting odd tidbits like how they’ll delete apps with bad logos, how they tend to organize apps into folders, and how they position apps on their device for easy access with their thumb, among other things. The full report is available from comScore’s website here.